A friend of mine has been espousing the virtues of the Baking Steel for over a year and half now. We don’t make very many pizza’s in this house, so I put it on my list of things that I want to buy in the future, but really can wait. Then I read all about the virtues of this steel plate in Modernist Cuisine, and I knew that I needed one sooner rather than later. 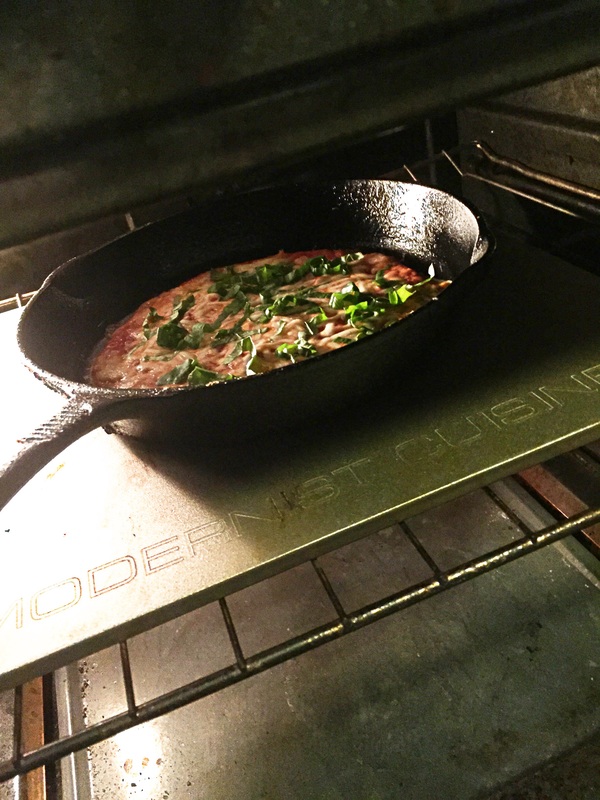 Aside from being a great way to make brick oven style pizza’s, the baking steel works as a plancha, an anti-griddle, and a teppanyaki. A multi-purpose gadget always excites me, so I ordered one. I came across a great article on Serious eats about a reversible version of the Baking Steel, and right next to it was a recipe for Extra-Crispy Bar-Style Tortilla Pizza and I knew that I had to try it. 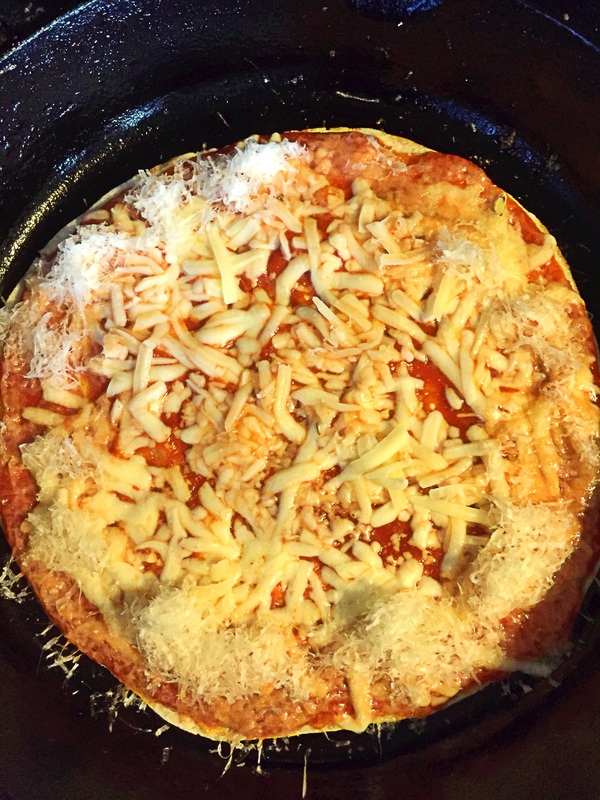 Leave it to me to buy a gadget made for making pizza only to put it aside to make a pizza in a cast iron skillet. After making this, I don’t know why I never thought to try making pizza with a tortilla as a base before. I’ve used naan, pita, and a middle eastern bread to make pizza before, so you would think it would have occurred to me to try one with a tortilla. 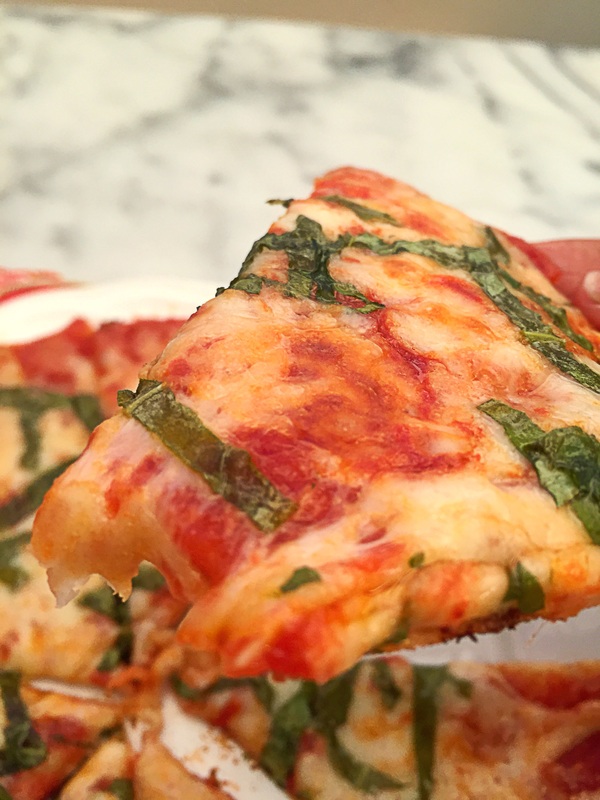 This pizza is super-duper easy, takes less than 10 minutes from start to finish, and it’s the best thin crust pizza that I’ve ever eaten. 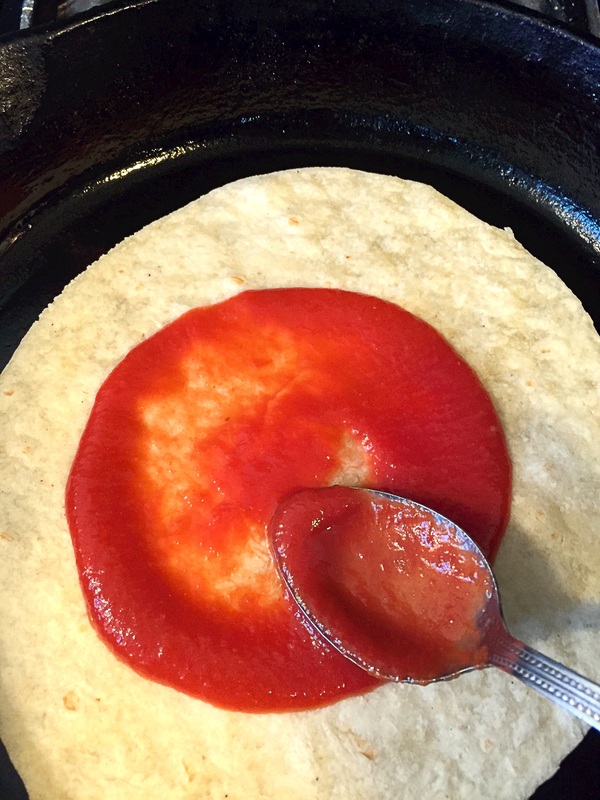 For my gluten free friends, this pizza is easily adapted to become gluten free by switching out the flour tortilla, with a gluten free tortilla, Whole Food’s sells a host of different varieties. You can add additional toppings to this, but I kept it simple. Directions: Pre-heat oven to broil. 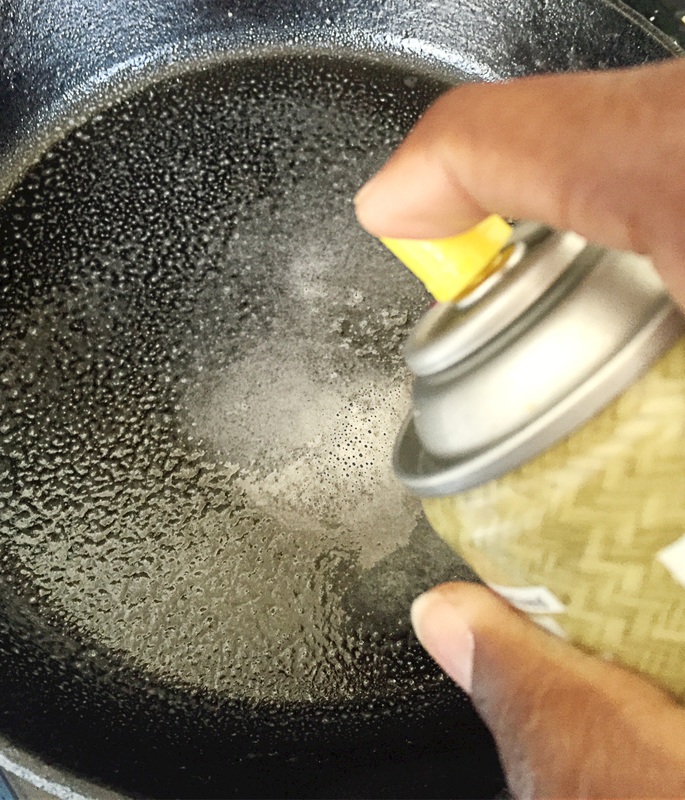 Add the oil to the cast iron pan and bring to temperature over high heat. 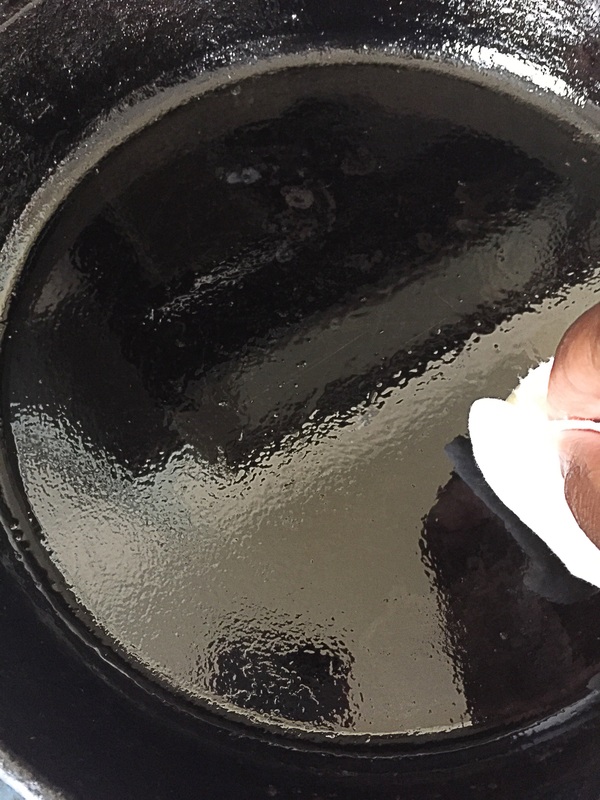 Once the oil is hot, wipe out any excess with a paper towel–be careful not to burn yourself. 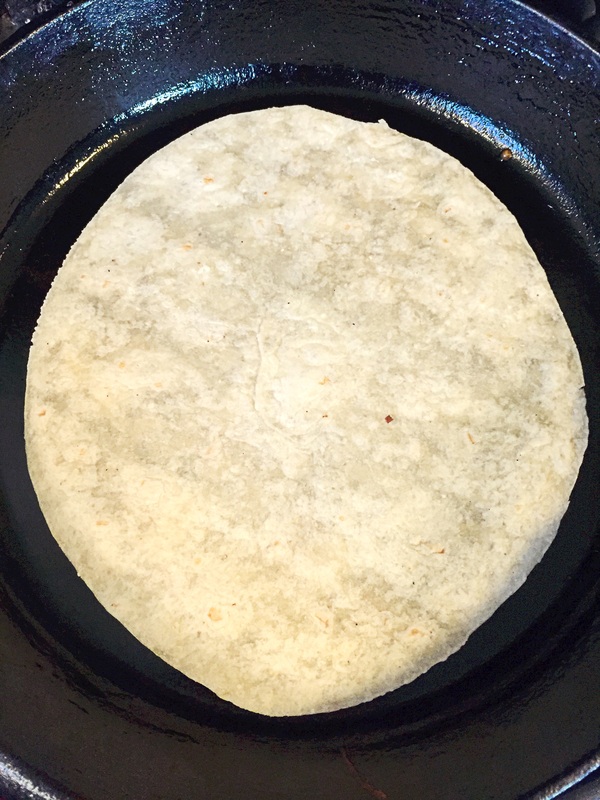 Add the tortilla to the pan, turn the heat down to medium-low. 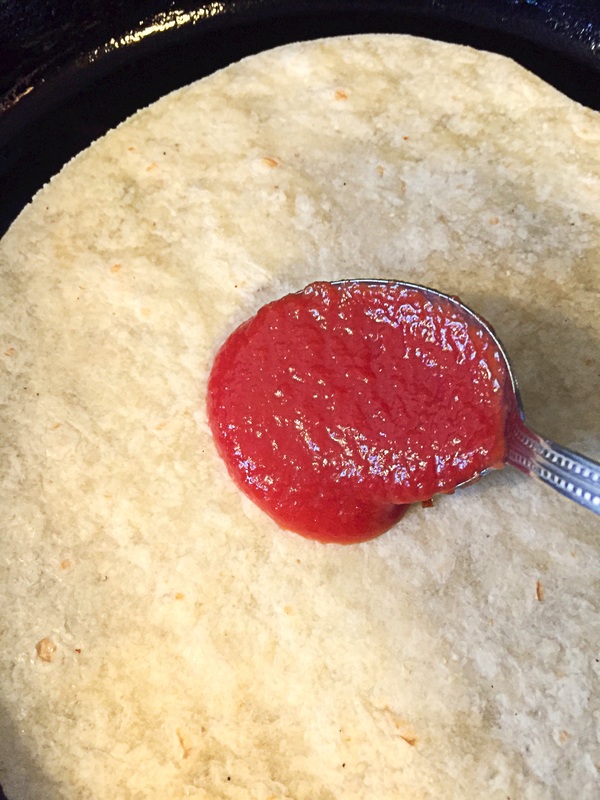 spread the sauce out evenly over the tortilla, all the way out to the edges. 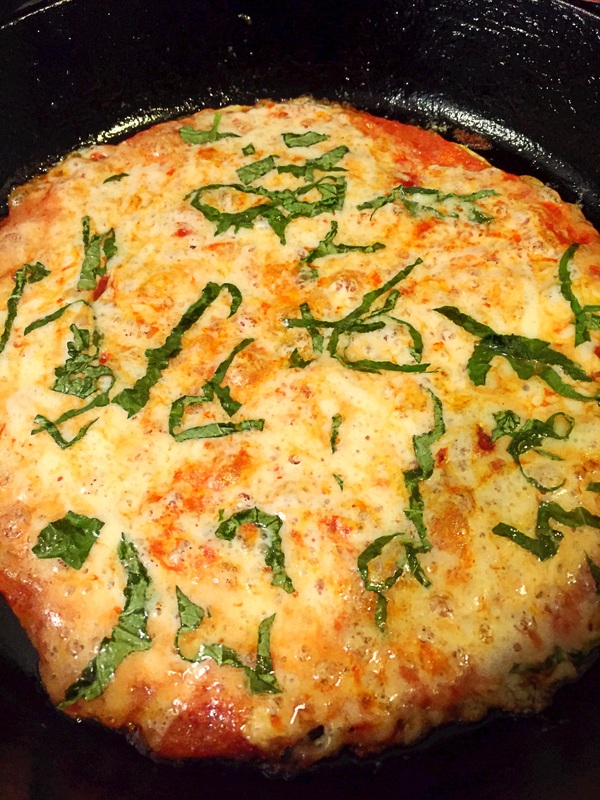 Then add the parmesan around the edges–you are giving your pizza a parmesean crust. 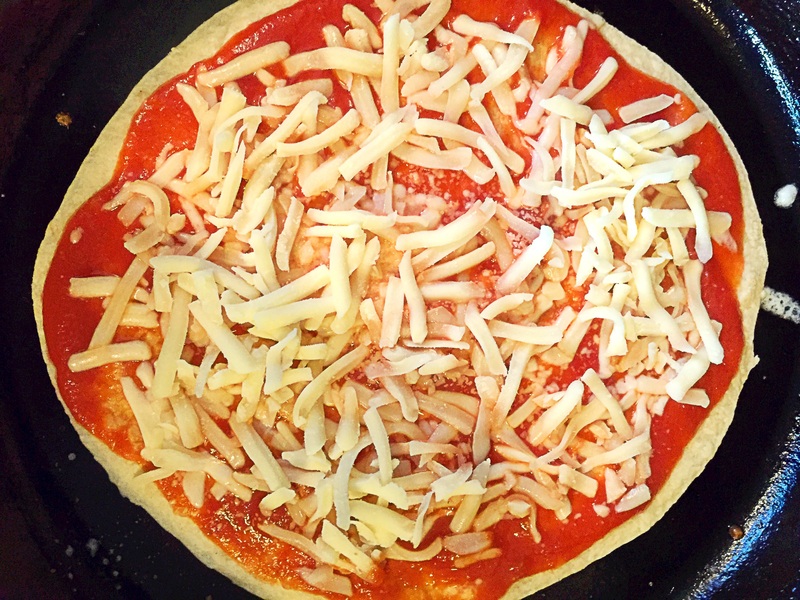 Allow the pizza to cook for 3-4 minutes or until the cheese bubbles and browns. Remove the pan from the oven. 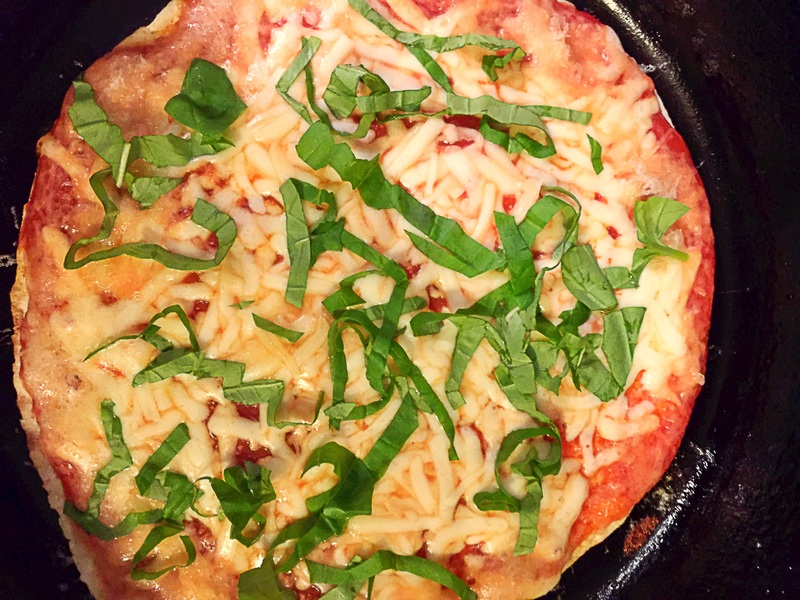 The pizza should be nice and crisp–if it is not, place the cast iron pan over a burner, turn on the fire and allow to cook for another 30-60 seconds until it’s nice and crisp. 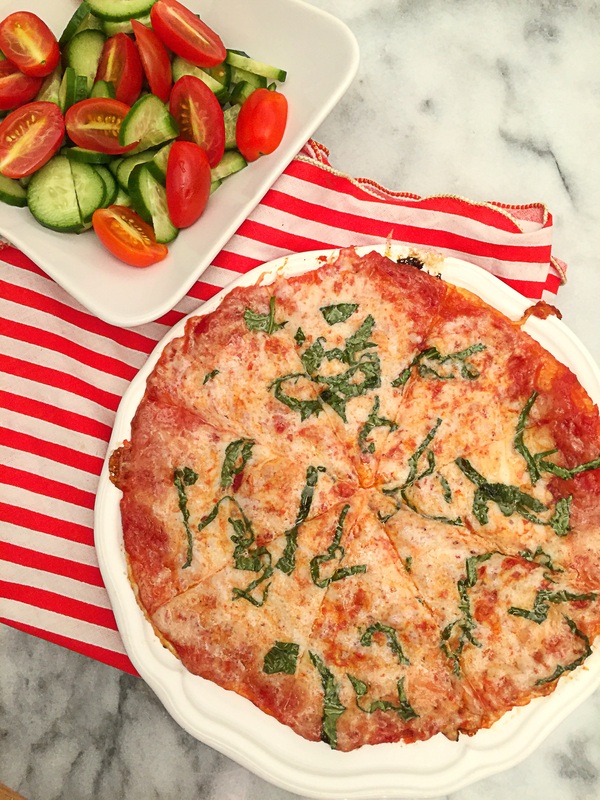 Remove the pizza from the pan slice, serve and enjoy! 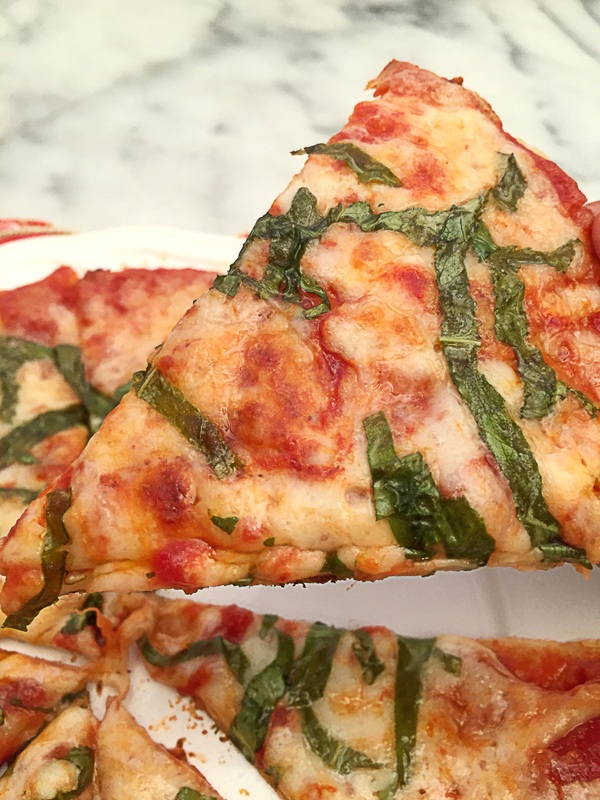 This recipe is only for one pizza, so if you need more adjust accordingly. My daughter enjoyed this so much, that she begged me to make her one for breakfast the next morning. 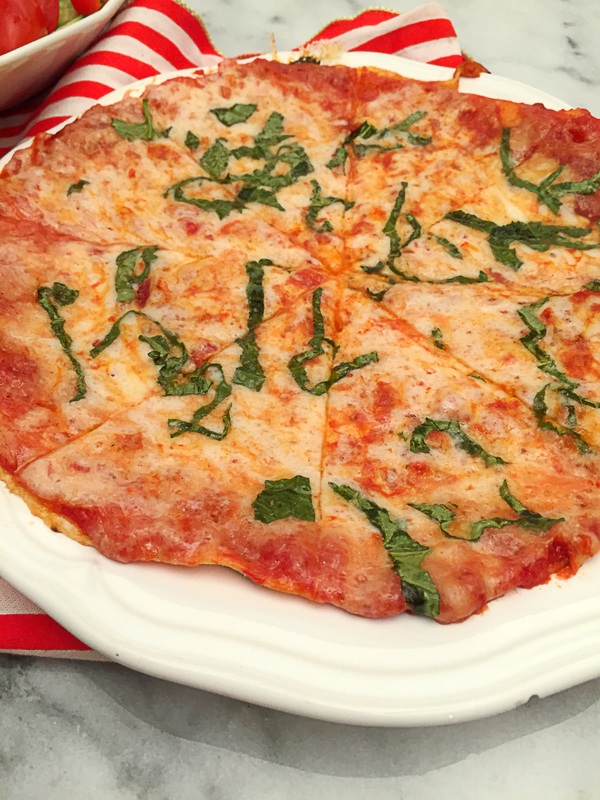 If you like this recipe you will probably like my recipe for Artisan Prosciutto Tomato and Basil Pizza. This entry was posted in dinner, Food, Food blog, gluten free, Healthy Whole Food Blog, quick fix meals, recipes and tagged crispy tortilla pizza, dinner, dinner recipes, easy dinner recipe, Food, gluten free, gluten free pizza, healthy recipes, how to make pizza, kid friendly recipes, lazy dinner recipes, pizza, quick fix dinner recipes, recipes, thin crust pizza recipe, tortilla pizza, vegetarian. Bookmark the permalink.